The title of this post might be a little misleading. There is magic, nor real smoke or mirrors. 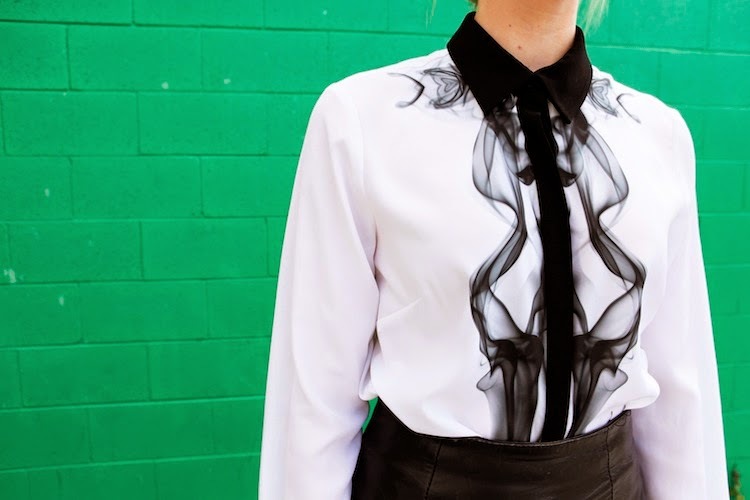 But there definitely is a mirrored smoke print on my shirt. So I guess there is partial truth. I'm always on the hunt for modern, wearable prints. I used to live by the motto: the brighter and busier the print, the more I must have it. Now I tend to stick to creative and striking, yet subtle, prints. Preferably black and white (of course). And this older Cameo blouse, while regrettably under-appreciated when I first got it, has now taken pride of place in closet for meeting all of those criteria. What's your perfect print?